Hank Ilesic remembers the sidelines well, his hands resting on a chain link fence in downtown Edmonton, watching his favourite team practice day after day. “Most of those players on that team were my idols. I’d watched them for years as I grew up,” Ilesic said. “I used to go to practice every day and watch, study and absorb as much as I could. Ilesic’s story has long been touted as a dream come true. He was a punting prodigy that was signed at 17 — he was still a student at St. Joe’s High School — by the team he idolized in 1977. He’d go from spectator to participant before he’d graduate and when he got on the field he was magic, booming punts high into the lights of stadiums across the country and fitting in seamlessly with a dynasty team that he believes will never be matched again in the CFL. Surrounded by greatness in Edmonton, he won five Grey Cups in a row with the Esks. Through a 20-year career, Ilesic was an eight-time CFL all-star and led the league in punting average six times (1978, 1980, 1986, 1988, 1991 and 1992). He played in nine Grey Cup games and won seven times, tying him for the most wins a player has had in the league. On the game’s biggest stage, Ilesic set Grey Cup records for the most punts (64) and the most punting yards (2,735). “They took me under their wing,” he said of his Edmonton teammates back in March, when the Hall of Fame class of 2018 was unveiled in Winnipeg. The scenario was made perfect by the Eskimos organization and head coach Hugh Campbell. “Coach Campbell had a way of getting the best out of his players,” Ilesic said. When the rest of the players on those Eskimo teams saw quarterbacks like Wilkinson, Warren Moon and Matt Dunigan splitting playing time, it set a precedent. No one was above this supremely talented team. “It made them better as players. It also makes it more difficult, more complicated for the opposition to practice for or have to prepare for,” Ilesic added. After Ilesic’s six years in Edmonton, he spent 10 in Toronto. With the Argos he enjoyed a career year in 1986, punting 164 times for 8,004 yards, which is the second-best single season in league history. He spent the 1995 season with Hamilton and returned twice as an injury replacement after that, playing three games for the BC Lions in 1998 and re-joining the Esks in the 2001 season. Ilesic finished his career in third-place on the all-time punting yardage list, with 91,753 yards. Today, Ilesic runs a high performance training gym in Orillia, Ont. He likes the idea of taking athletes that are in a similar place that he was as a kid in Edmonton, standing on the other side of the fence with a dream. He’s helped kickers land with universities across eastern Canada. It’s a role he takes seriously. “I do have a screening process in regards to who I will work with and who I will develop. As the kicker and the athlete develops it’s also a reflection on me, so I do take care and I’m very careful in regards to who I work with,” he said. “Basically it starts with the parents. Supportive parents, understanding parents, good grades in school, good character. 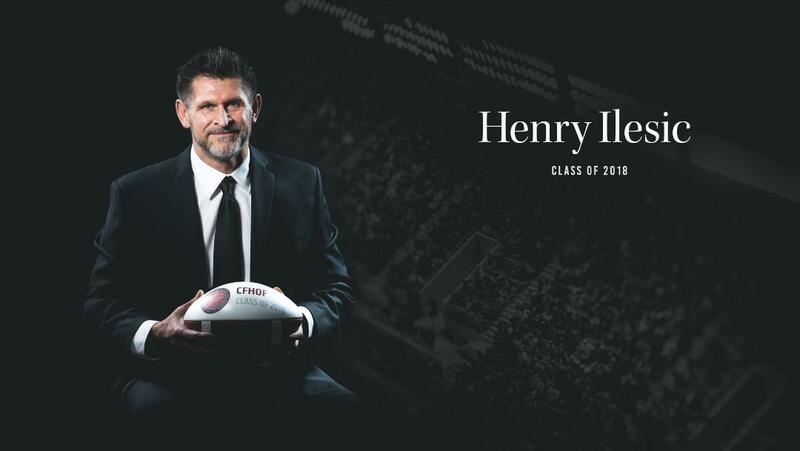 As he steps into the Canadian Football Hall of Fame, Ilesic’s story becomes a young kid’s wildest dream being realized.